Here's part five of the recent Department of Lands mega project. The project was a manual outlining various management and construction techniques and laws for land, forest and road management. 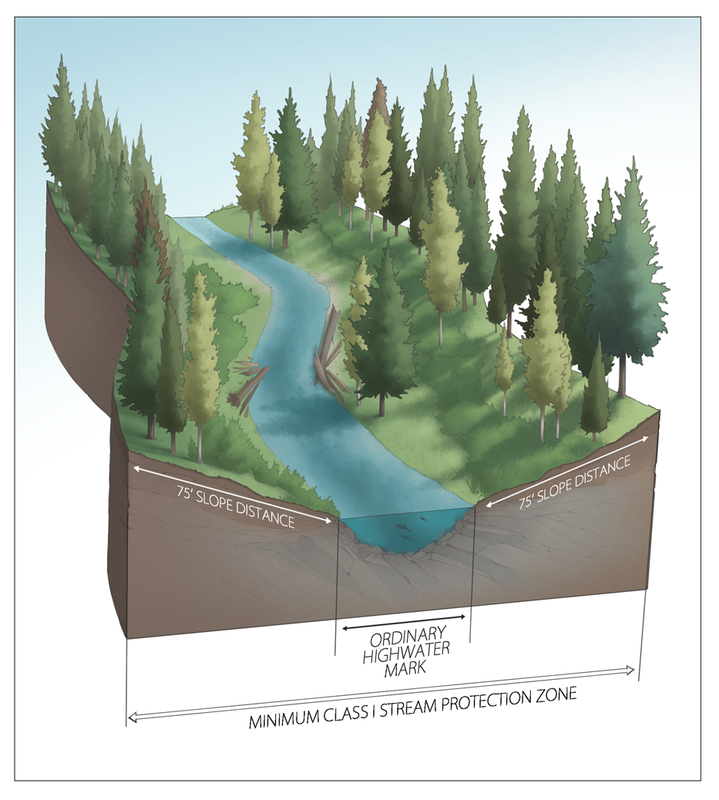 A lot of the materials covered watersheds and preventing erosion, runoff and contamination. I was hired to illustrate various figures within this manual (and was pleased as punch to do so). Why, you may be asking, in this age of technology and whatnot, is anyone still using illustration? Why don't people just use stock images and photography? Or take their own photographs? By the way, them's fightin' words. 1.) If your subject matter is new, theoretical, hypothetical or imaginative, chances are there just aren't any images of that subject matter. 2.) While using stock images and photography could work for certain applications, you have no control over the subject matter itself (angle, size, proportion, tone, etc.). Having custom illustrations created for your project means your images can show exactly what you want, how you want. 3.) Using stock images means you run the risk of using an image that's already been used hundreds or even thousands of times. That could send the wrong message about your work. 4.) Finally, illustration is unique and visually interesting. It draws attention. Ok, no more soap boxing. How about some drawings? Two road type cross sections. 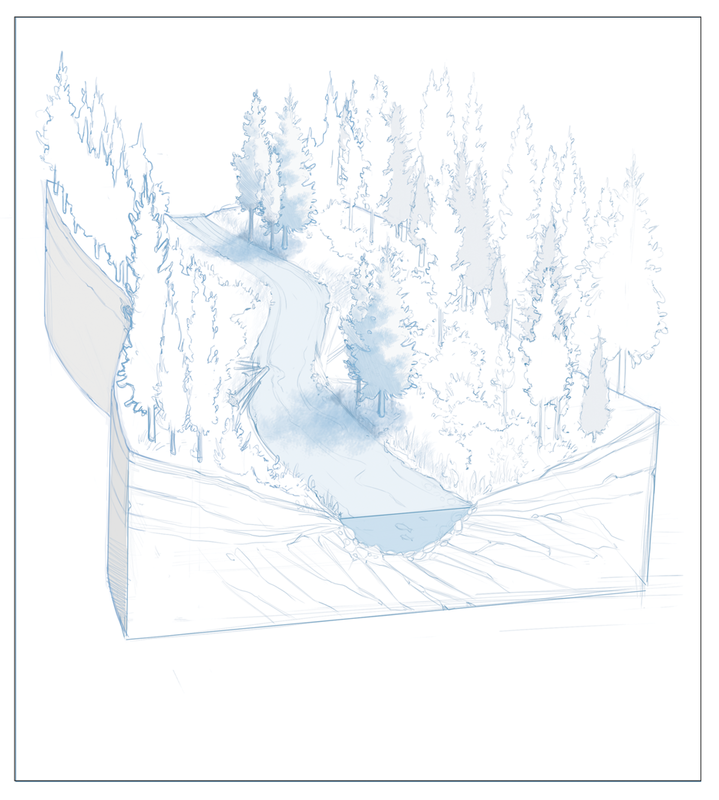 This is the layout sketch for the "Class 1 Stream Protection Zone", which is the area around a stream that, as the name might suggest, is protected. This one took quite a bit of time, but I'm happy with the result. 'Nuff said. I love your technical drawings. You have a great ability to balance accuracy and information with whimsy. My one request, see if you can sneak Bigfoot into a forest illustration? Thanks, Andrew. That's a big 10-4 on Bigfoot. Would you prefer him/her blurry or not blurry? In the range of "wait, is that Bigfoot" reaction blurriness. With all the land erosion manuals I read, I'll try to remember to keep my eye out for him.